E K Janaki Ammal was a renowned botanist and plant cytologist who made significant contributions to genetics, evolution, phytogeography and ethnobotany. This brief biographical sketch describes her life and work. 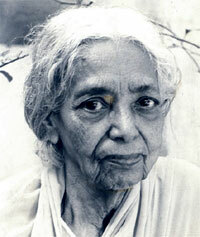 Life - Janaki Ammal was born in Tellichery, Kerala, in a cultured middle class family on 4th November 1897. Ammal’s father was a sub-judge in whatwas then the Madras Presidency. She had six brothers and five sisters.After schooling inTellichery, shemoved to Madras where she obtained the Bachelor’s degree fromQueen Mary’s College and her Honours degree in Botany from the Presidency College in 1921. She then taught at the Women’s ChristianCollege (WCC),Madras (nowChennai),with a sojourn as aBarbour Scholar at theUniversity of Michigan in USA where she obtained her Master’s degree in 1925. Returning to India, she continued to teach at theWCC, butwent toMichigan again as the first Oriental Barbour Fellow where she obtained her DSc in 1931. On her return, she became Professor of Botany at the Maharaja’s College of Science, Trivandrum and taught there during 1932–34. From 1934–1939 she worked as Geneticist at the Sugarcane Breeding Institute at Coimbatore. She then left for England and during 1940–45 she worked as Assistant Cytologist at the John InnesHorticultural Institution in London, and as Cytologist at the Royal Horticultural Society at Wisley during 1945–51. Invited by the then Prime Minister of India, Jawaharlal Nehru, to accept an assignment as Special Officer to reorganize the Botanical Survey of India (BSI), she returned to India in 1951. From then on, besides the reorganization of the BSI, Ammal continued to be in the service of the Government of India in various capacities including heading the Central Botanical Laboratory at Allahabad and Officer on Special duty at the Regional Research Laboratory in Jammu andKashmir. Sheworked for a brief spell at the Bhabha Atomic Research Centre at Trombay and then settled down in Madras in November 1970, working as an Emeritus Scientist at the Centre for Advanced Study in Botany, University of Madras. She lived and worked in the Centre’s Field Laboratory at Maduravoyal near Madras until her demise in February 1984. Ammal was elected Fellowof the Indian Academy of Sciences in 1935 (the year itwas founded bySirCVRaman) and of the Indian National Science Academy in 1957. The University of Michigan conferred an honorary LLD on her in 1956. The Government of India conferred the Padma Sri on her in 1957 and theMinistry of Environment and Forestry instituted the National Award of Taxonomy in her name in 2000. Work - Only Ammal can endow the above ‘cradle to cremation’ recount with flesh and blood. However, one can look at the course of her life and work in the context of her times, of her nature and upbringing, of challenges and opportunities before her, and of her view of life and work reflected in her own life and work. I met and was introduced to Ammal for the first time in July, 1950 at the International Botanical Congress in Stockholm, Sweden. The Indian participants at the Congress were entertained by the Indian ambassadorRKNehru and hiswife at the Indian Embassy. Besides Ammal, the invitees included F R Bharucha, K A Chowdhury, P Maheshwari, V Puri, T S Sadasivan, Savithri Sahni, J Venkateswarlu, and myself. I saw Ammal again in January 1951, this time at India House in London at a reception arranged by the Indian High Commission to meet the then Prime Minister of India, Jawaharlal Nehru, who had come for the Commonwealth Prime Ministers’ Conference. Recognizing me, Ammal very kindly introduced me to the Prime Minister. Ammal was then working at Wisley on the cytogenetics of Magnolia, as I understood fromher. After her return to India Imet her at scientific meetings where she was held in high esteem. Ammal came to the celebration of the Silver Jubilee of the National Institute of Sciences of India (now the Indian National Science Academy) at Delhi on 30 December, 1960 at which, by a coincidence, having been elected that year, I was asked to formally sign the Register of Fellows in the presence of the Prime Minister, Jawaharlal Nehru. In the group photograph taken then, it is noteworthy that Ammal was the only lady. During the years I headed the Centre for Advanced Study in Botany inMadras, we hadAmmal with us throughout as an Emeritus Scientist. Shewas a quiet, unassuming, and unobtrusive but active and dynamic colleague, bearing her greatness lightly. She was verymuch a part of the CAS in Botany family. In the matrilineal families in Kerala, women normally enjoyed freedom and privileges much more than in many other parts of India. In enlightened families such as Ammal’s, girls were encouraged to engage in intellectual pursuits and in fine arts. Ammal must have been born with a passion for plants to have chosen to study Botany and to have gone to Madras to do so. Under the influenceof teachers at the PresidencyCollege,Ammal’s passion sharpened her love of nature and the study of plants in their natural environment. Her life reflects her experiments in settling for a career and, more importantly, for a mission. First, she took to teaching. Not content, she took to research. Her two innings in Michigan were crucial in determining the choice of her specialization in plant sciences: she chose cytology which in those formative years of the science was concerned primarily with the nucleus and the chromosomes. The early decades of the last century saw a great deal of pioneering work in genetics, notably on wheat and on sugarcane. At the Sugarcane Breeding Institute at Coimbatore, C A Barber and T S Venkataraman initiated research in sugarcane breeding. Venkataraman developed the internationally famous Coimbatore canes such as Co 419 with qualities of drought- and diseaseresistance. The Co varieties were grown in all parts of India and were also preferred for cultivation in other countries where sugarcane was an important crop. It was in this scenario that Ammal quit her teaching position in Trivandrum and joined the Institute at Coimbatore. Ammal made several intergeneric hybrids: Saccharum x Zea, Saccharum x Erianthus, Saccharum x Imperata and Saccharum x Sorghum. Ammal’s pioneering work at the Institute on the cytogenetics of Saccharum officinarum (sugarcane) and interspecific and intergeneric hybrids involving sugarcane and related grass species and genera such as Bambusa (bamboo) is epochal. But that was just the beginning of a life in science well lived. Dioscorea, besides a range of medicinal and other plants too many for mention here. Ammal was an original thinker and she attributed the higher rate of plant speciation in the cold and humid northeast Himalayas as compared to the cold and dry northwest Himalayas to polyploidy. Also, according to her, the confluence of Chinese and Malayan elements in the flora of northeast India led to natural hybridization between these and the native flora in this region, contributing further to plant diversification. Following her retirement, Ammal continued to work unabated, focussing special attention on medicinal plants and ethnobatany. She continued to publish original findings of her research. In the Centre forAdvanced Study Field Laboratorywhere she lived and worked she developed a garden of medicinal plants with great zeal and dedication. Though cytology was her forte all through, her work embraced genetics, evolution, phytogeography and ethnobotany. A View of Her Life and Work - Viewing her life and her work, I would say this of Ammal: From a young age, she was endowed with the courage to make choices and the versatility to change course and adapt where and when required. With her passion for plants, she defined for herself her goals and purpose, and her mission in life. Having done that, she kept hermission above everything else and stuck to it till the end. Crop plants, garden plants, plantation crops, medicinal plants, plants in the wild and plants of the tribals – all species were interesting to her. She just worked on what was on hand and within reach. And, there was much that was on hand and within reach. Her familiarity with British plants was matched by her familiarity with tropical species. She led a simple life of total dedication to hermission, remaining single. Her physical needs were few and she was unostentatious andmodest to the core.Aperson of clean habits, I believe Ammal did not suffer from any serious health problems. Having been active throughout was her strength. Her initial needs and her education taken care of by her parents, she taught and worked. With a scholarship or fellowship or a scientist-position, she carved out for herself a career of her own, partly abroad and partly in India. To have spent the cruel war years in an alien country in the study of garden plants needed courage of a special kind.When war clouds were on the western horizon to be battered by what Winston Churchill called the “gathering storm,” why did Ammal leave her country to take up a position in Britain? Did she have any support? My conjecture is that India’s freedom fighter in Britain, Krishna Menon, only a year older to her, and her contemporary inTellichery and at the PresidencyCollege,Madras, could have been instrumental.Menon was also probably the link to her acquaintancewith India’s first PrimeMinister – I do not know for certain. Ammal was thoroughly Indian in attire and habits, and Gandhian in her lifestyle. he was too selfless to seek favours or the limelight and yet honours came to her unsought, something that is true ofmany greatwomen andmen. The honorary LLD which the University of Michigan conferred on Ammal in 1956 in recognition of her contributions to botany and cytogenetics said: Blessed with the ability to make painstaking and accurate observations, she and her patient endeavours stand as a model for serious and dedicated scientific workers. When required, she did not shirk fighting for a cause or for a right. Her integrity and professional ethics are beyond doubt. She lived up to her own definition of greatnesswhich combined virtue in life and passion in the pursuit of her science. There is thusmuch for us to emulate in her life and work. Academy, 13, pp.90–101, with portrait, 1988. P Maheshwari and R N Kapil, Fifty Years of Science in India.